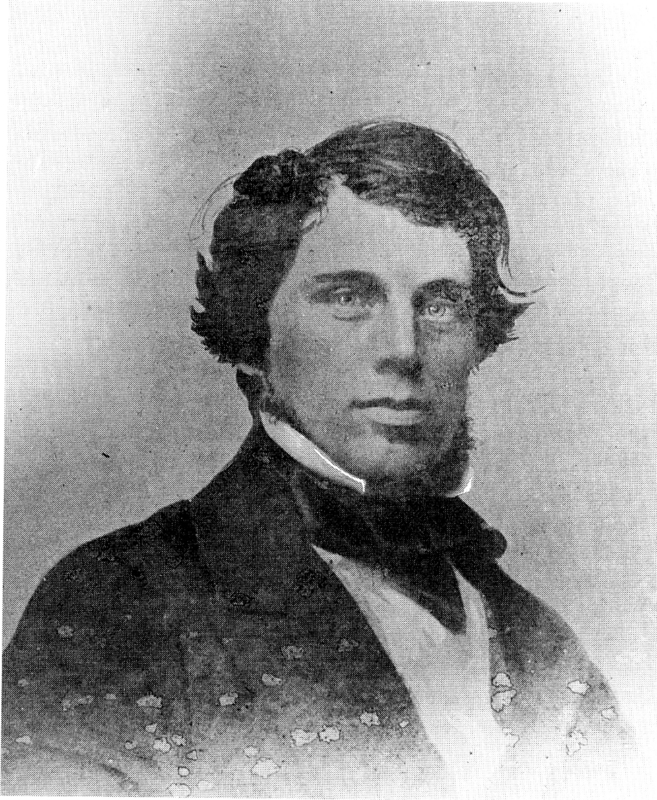 James Edward McConnell. 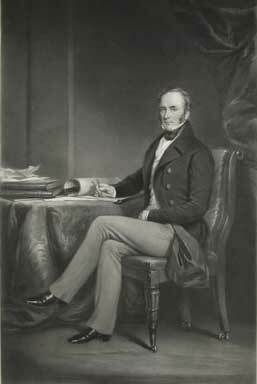 He was the Superintendent of Wolverton Works, succeeding Edward Bury in 1846. He was responsible for designing the faster and more powerful locomotives that once embellished Wolverton’s reputation before locomotive building was consolidated at Crewe. George Carr Glyn was a leading figure in railway building, being first chairman of the L&BR and subsequently of the L&NWR. He was a banker and by the time he made this speech was an MP. He was later ennobled and took the title of Baron Wolverton. Rev. Mr. Fremantle is, I think, William Robert Fremantle, second son of Sir Thomas Fremantle. The reporter introduces him as “of the new church built here by the company” but I think this may be a reporter error. The incumbent was, and had been from the beginning, George Weight, acknowledged in a later speech. This Fremantle may have been a curate, but I can’t think that he would be the one saying grace at such an important occasion while George Weight remained in the shadows. There were two Fremantles of this period who had church careers. W R Fremantle, mentioned above, and his nephew, William Henry Fremantle, who was not ordained until 1855. This leaves us with one candidate. William Robert Fremantle was a senior divine in the C of E and a respected writer and editor on theological subjects. He was probably present at the request of the directors to represent the Buckinghamshire interest. He easily outranked poor old George Weight who was merely Vicar of St. George’s. Weight is acknowledged in Glyn’s remarks but was clearly not important enough to sit at the top table. Sir Harry Verney (1801-1894) was actually born into the Calvert family of Hertfordshire and changed his name to Verney on inheriting the Verney estates at Claydon. He was a long-serving and influential MP for Buckingham and was very active in promoting the railway interest in Buckinghamshire. verney Junction is named after him. He also married, as his second wife, Parthenope Nightingale, Florence’s sister. 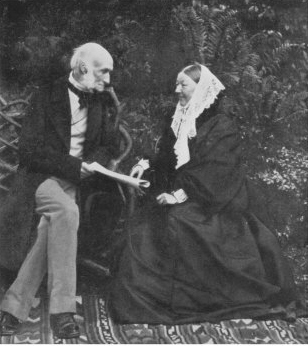 He is shown here in old age with Florence Nightingale. William Lucy was Lord Mayor of Birmingham from 1849-50. George Cruikshank was a very famous contemporary illustrator and at the time of this occasion at the peak of his fame. Even today he is remembered for his caricatures of the Regency period and his illutrations for several of Dickens’ novels. Exactly why he was asked to grace the top table is not evident. He was not, as far as we know associated with railways and the speech he gave on this occasion is not particularly entertaining. One might conclude that one of the directors invited him along. The sketch above is a self portrait of the artists in middle age. He was born in 1792 and close to 60 on this occasion. Captain Mark Huish was the general manager of the L&NWR and is recognized as one of the great railway managers of that period. His speech might strike one today as very defensive. There were of course many railway accidents in those early years and the press gave them publicity and there was public concern, even alarm. Travel at speeds of 30 mph and above was a completely new experience for this generation and there was much trepidation. 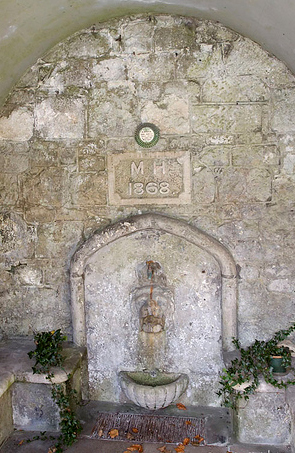 Huish, however, is responding in a manner which is common enough today – “Everyone is working very hard and doing their best in difficult circumstances.” The memorial above at Bonchurch in the Isle of Wight is from a photo taken by Kevin Quick of Leighton Buzzard. He has an excellent website about the history of Leighton Buzzard and Linslade. Here follows The Times reporting of the speeches. Mr. Barron, in a few words, proposed the speedy operation of the Buckingham Railway, in connexion with the health of the county member. The Rev. Mr. Fremantle, in speaking to the same toast, vindicated the character of railway labourers, and declared there were no men he would sooner have to deal with. After a few words from Dr. MacKay, who was introduced to the meeting by Mr. Cruikshank. Captain Huish proposed the health of “The Press”. They might be of opinion that the press just now bore rather hard on the railway interest. When they were hard set for a leader, and Parliament was not sitting, they set to work to abuse the railways. (Cheers and laughter.) But still the daily press had done them good service. True, it was often made the means of intimidation. For instance, if any of the ladies, of whom he had spoken before, did not find her bandbox or bag forthcoming, she wrote to hi at once – “Sir, if my box is not returned in two days I’ll write to The Times.’ (loud laughter.) That was the panacea for all their evils. (Renewed laughter.) Some time ago a gentleman was smuggling a suckling pig in one of the carriages. One of the porters saw it, and said he must pay 6d. for it. “What! Am I to pay for a sucking pig, when you let children in arms go free?” (Laughter.) And if the money was not returned he supposed the next letter would be “I’ll write to The Times.” (Cheers and laughter.) Lost luggage was an unanticipated problem for the railways. In time most railway stations, particularly the termini, maintained Lost Property Offices. Mr. Watkin, Assistant Secretary, and Mr. Henderson, one of the workmen, addressed the meeting, and other gentlemen were preparing to get on their legs, when we were obliged to get on ours to catch the last train; but their audience had greatly diminished, as the speeches were long, and could not be heard in the remoter parts of the hall, and a dance and supper elsewhere had powerful attractions. All the arrangements, which were under the management of Mrs. Hibbert, were very creditable to her taste and industry. A long programme of music was still undisposed of at half-past ten o’clock. Mrs. Leonora Hibbert was the manager of the Refreshment Rooms, and from all accounts a formidable organizer. Catering for 1,500 people, especially in those times, must have been an enormous undertaking, and necessitated the hiring of a large number of temporary staff. Note that 14,000 cups and saucers had been prepared, according to the reporter. There would have been no time for washing up until after the event. I have written a brief life of Leonora Hibbert here.